"Abrigo Nuclear" (1981 - 86 minutes) is a drama of science fiction distributed by Embrafilme, directed by Roberto Pires and written by Pires and Orlando Senna. The movie shows the harmful effects of the radiation, and the contamination of the human beings and the entire planet as a consequence of the soil saturation by atomic garbage. The humanity abandons the surface and has to live in nuclear shelters. The discussion about the dangers of the use of nuclear energy was a mark in the career of Roberto Pires. Due to his concerns about the controversial question he also directed the movie "Cesium 137, o Pesadelo de Goiânia", nine years later. Pires was a disciple of the Brazilian physicist César Lattes, and a kind of a voluntary consultant of his works. [abrigo-logo] The cast of "Abrigo Nuclear" was: Marília Araújo, Marco Bahia, Norma Bengell, Bárbara Bittner, Antônio Fontana, Nonato Freire, Renato Lavigne, Leonel Nunes, César Pires, Ronny Pires, Fred Ribeiro, Conceição Senna, Sandra Valença and Roberto Pires. The Brazil contributed with another film of science fiction on the subject: "Parada 88: o Limite de Alerta "(1978), directed by José de Anchieta, about the problems of the nuclear energy before the accident of Chernobyl. Born in the city of Salvador-BA, Roberto de Castro Pires, photographer, producer, writer and director, died in 2001, at the age of 67 years. As a photographer and a student of optics, he invented his own lens, that he called "Igluscop". He worked in documentaries and was a participant of the New Cinema, in the beginning of the 60's with Glauber Rocha. With his lens he filmed "Redenção" (1959), the first movie produced in the state of Bahia. 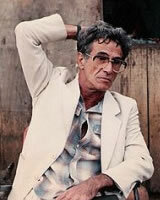 Filmmaker and director Roberto Pires was born 1934 in Salvador da Bahia. Living in Rio de Janeiro, he was interested in ecological issues and especially in the question of nuclear energy. While the military government was signing an agreement with Germany for the construction of nuclear power plants in the state of Rio, he was trying to make a documentary to expose the danger of nuclear energy. In 1987 the nuclear accident in Goiânia with Caesium 137 called his attention. Pires investigated the terrible accident, interviewed the survivors and became contaminated with the deadly radioactive Element. After a long period of suffering, Roberto Pires died June 27, 2001, from cancer. "Cesium 137: The Nightmare of Goiânia" received six awards at the Brasilia Film Festival 1990 and now the Audience Award of the 1st Uranium Film Festival of Rio de Janeiro. "Césio 137. O pesadelo de Goiânia" won the Audience Award of the festival for the best movie and feature. It was produced by Laura Pires as well as the winner of the Audience Award for the Best Short Documentary "Césio 137. O brilho da morte", that also was selected by the Uranium Film Festival Jury as one of the eight best documentaries of the festival 2011. Cineasta e Diretor, Roberto Pires nasceu em 1934, em Salvador, Bahia. Ele estava interessado em questões ecológicas e especialmente na questão da energia nuclear. Ele era o priemeiro cineasta brasileiro pensara temática nuclear. Enquanto o governo militar assinava um acordo com a Alemanha para a construção de usinas nucleares no Estado do Rio de Janeiro, Roberto Pires estava tentando fazer um documentário para expor a perigo da energia nuclear. Uma grande coincidência aconteceu enquanto Roberto Pires estava morando em Brasília para buscar patrocínio para o seu filme Inverno Nuclear. Em 1989, um acidente radioativo em Goiânia, a 200 quilômetros da capital do país, contaminou várias pessoas. Pires investigou o acidente e entrevistou os sobreviventes. Durante as filmagens, ele procurava gravar as cenas fielmente baseadas na realidade dos fatos. A preocupação em se ater com a realidade fez com que Roberto entrasse no contêiner em que a cápsula foi aberta. Poderia, simplesmente, simular o local em um cenário. Ninguém ia notar a diferença. Para o cineasta, não bastava. Tinha que ser no mesmo local. A produção do filme não quis entrar no local. O risco da radioatividade era grande. Pessoas tinham morrido por ter contato com o césio. O câmara também não quis entrar. Roberto foi sozinho com a câmara e gravou as cenas internas. Amigos e familiares atribuem a este fato o agravamento ou o surgimento de um câncer no pescoço. O amor pelo cinema e a preocupação com a fidelidade aos fatos ofuscaram o perigo que havia no local. Após um longo período de sofrimento, Roberto Pires morre de câncer em 27 de junho de 2001. ABRIGO NUCLEAR - Brasil, 1981, Director and Producer Roberto Pires. Fiction, 86 min, Portuguese with English subtitles. Brazil´s first science fiction questioning the use of nuclear power. In the future the Earth's surface is radioactive polluted, because of the atomic waste of nuclear power plants. The population is forced to live in underground nuclear shelters. http://www.memoriarp.com Roberto Pires died 2001. Brazil, 1981, 95 min Director: Roberto Pires Production: Roberto Pires e Oscar Santana. In the future ... Due to radioactive pollution of the environment, mankind tries to survive in the underground corridors of a bunker. Produced in 1979, the film is a fiction, a result of the filmmaker's interest with the nuclear issue, and his encounters with the scientist Cesar Lattes. In the cast: Norma Begell, Brazil´s Julia Roberts at that time.